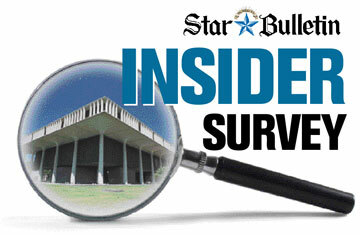 The Honolulu Star-Bulletin Insider Survey is a new way of looking at local politics. It is an attempt to help explain how judgments are made on local political issues. To do that, we patterned a survey similar to the Insiders Poll conducted in the Washington-based National Journal. The Journal's survey uses members of Congress and political consultants. Hawaii doesn't have a large number of professional political consultants, but many island lobbyists get involved in local campaigns. So we substituted lobbyists from labor, business and social organizations. We also asked veteran members of Hawaii's Legislature and Neighborhood Board presidents to help with our survey. Fifty people responded to the questions. Respondents were told that we wouldn't attach their names to their opinions, but we would list the names of all those who responded. See the Insiders list below. The survey, which we hope to continue every month during the campaign season, is not a scientific poll, but it should give readers a new view on what makes up Hawaii's "conventional political wisdom." Q: Who are the most overrated and underrated politicians in Hawaii? Gov. Linda Lingle is far and away the most overrated; 28 respondents mentioned her. Honolulu City Councilman Charles Djou comes in second with five votes. Mayor Hannemann had four votes, U.S. Rep. Ed Case, Rep. Marcus Oshiro and U.S. Rep. Neil Abercrombie each had three votes. Sen. Daniel Inouye got two votes, and the following had one vote each: Sen. Sam Slom, Rep. Kirk Caldwell, Sen. Daniel Akaka, Lt. Gov. Duke Aiona, Rep. Calvin Say and Sen. Colleen Hanabusa. » She's a good campaigner but ineffective on the job. » Gets strong media coverage, but has few achievements. » Despite her "enormous ability," Lingle has not built a centralist political dynasty. » The number of elected Republicans has gone down, not up, on her watch. House Education Committee Chairman Rep. Roy Takumi (D, Pearl City-Pacific Palisades) and House Speaker Calvin Say (D, St. Louis Heights-Wilhelmina Rise) were the leaders. Takumi had seven votes, and Say had six. The following had two votes: U.S. Sen. Daniel Akaka, state Reps. Bob Nakasone, Joe Souki, K. Mark Takai, state Sens. Colleen Hanabusa and Sam Slom, and Honolulu City Council members Charles Djou, Gary Okino and Ann Kobayashi. Getting one vote each were Gov. Linda Lingle, state Reps. Hermina Morita, Bob Herkes, Lyla Berg, Mike Magaoay, Brian Schatz, Lynn Finnegan, Blake Oshiro and Tommy Waters; state Sens. Roz Baker, Brian Taniguchi, Robert Bunda, Suzanne Chun-Oakland; Big Island Mayor Harry Kim, Honolulu Council members Romy Cachola and Nestor Garcia, Honolulu City Council Chairman Donovan Dela Cruz, former Gov. George Ariyoshi and President Bush. » House Speaker Calvin Say: Influential, low-key style. » Rep. Roy Takumi: Thoughtful leader with added leadership potential. » Councilman Charles Djou: Intelligent, common-sense response to issues. » U.S. Sen. Daniel Akaka: Wins points with his warm, open personality. Q: What are the most overreported and underreported political stories in Hawaii? The gasoline price cap is the one story that drives people nuts, with 12 saying it has been overreported. Trips by the governor (this survey was taken during her recent trip to the Philippines) and the issue of public education each got five votes. » Gas price cap: "The gas cap story is boring and overdone." » Governor's foreign travel: "Linda Lingle's travel -- it's not newsworthy that the governor has boarded a plane to 'improve relations' between Hawaii and some other country." » Democratic spin: "The most overreported political story in Hawaii is what actions are taken by the Democratic-controlled Legislature. There never seems to be in-depth reporting of the issues with unbiased analysis. Instead, the Democratic spin is played up in the overreported political stories." » Public education: "The state of public education in Hawaii, with the bureaucratic tangles between the governor, state Legislature and the Board of Education. This would be my opinion on the overreported political story -- especially with how funds are spent or not spent." No specific trends or dominate issues surfaced, but Insiders surveyed were concerned that not enough is reported about the state's social safety net, hospital care and campaign ethics. » Visa obstacles: "Many hundreds of foreign students studying here at the high school, college and graduate school level have been significantly compromised by increasingly restrictive visa application procedures for students, particularly from Japan." » Scarce medical care: "The neighbor islands are woefully, dangerously underserved (and) understaffed by medical professionals." » Social issues / disadvantages: "I'd have to say that social justice issues are the most underreported issues ... homelessness, violence against women, oppression of any kind." » Tax hikes: "The most underreported political story is all of the tax increases that have been imposed recently." » Political power broking: "The fact that most of what happens publicly in the Legislature is theater. Decisions are made behind closed doors in closed caucus meetings and private meetings with lobbyists and colleagues. So, what happens privately is what drives final outcomes." LEGISLATORS: Rep. K. Mark Takai (D), Rep. Robert N. Herkes (D), Rep. Brian Schatz (D), Rep. Cynthia Thielen (R), Rep. Josh Green (D), Rep. Kirk Caldwell (D), Rep. Barbara Marumoto (R), Rep. Kymberly Pine (R), Sen. Robert Bunda (D), Sen. Fred Hemmings (R), Sen. Russell Kokubun (D), Sen. Will Espero (D). NEIGHBORHOOD BOARD MEMBERS: Cynthia K.L. Rezentes, DeeDee Letts, Nadine Nishioka, Ben V. Acohido, Lester Muraoka, Bob Chuck, William Woods-Bateman, Lester Muraoka, Albert Fukushima, Lester Fukuda. LOBBYISTS: Rick Tsujimura , Robert M. Witt, Red Morris, Garen Deweese, Carl Takamura, Amy Hirano, John Radcliffe, Andy Chang, James Kuroiwa, Chris Pablo, Jack Hoag, Annelle Amaral, Donna Ikeda, Roger Takabayashi, Cynthia Hayakawa, Kelly Rosati, Randy P. Perreira, Lorraine H. Akiba, Linda Chu Takayama, Robert Toyofuku, Chip Uwaine, Guy Fujimura, Charles Toguchi, Jeffrey Mikulina, Rick Egged, Linda Rosehill, Bette Tatum, Dave Rae.